I could have insisted that my crew call me your highness today - on account of the fact that I spent most if it far from the ground, tethered into a man lift. I was welding the armatures for the posts and beams that hold up the front of the Summit Trading Post. I was really up there! As always the pencil rod frames hardly show up in the photographs but they are the basis for all that is to follow. I managed to get about half of the beams done today. By mid-day Tuesday we should be finished the welding on the building and I'll breathe a sign of relief when it's done. Welding miles of steel onto a wooden structure is nerve wracking. At quitting time, just before I came back to earth I turned around and snapped a few pictures of the crew working down in the Wilderness Adventure entrance. They were wiring the posts today before the spindles are installed. 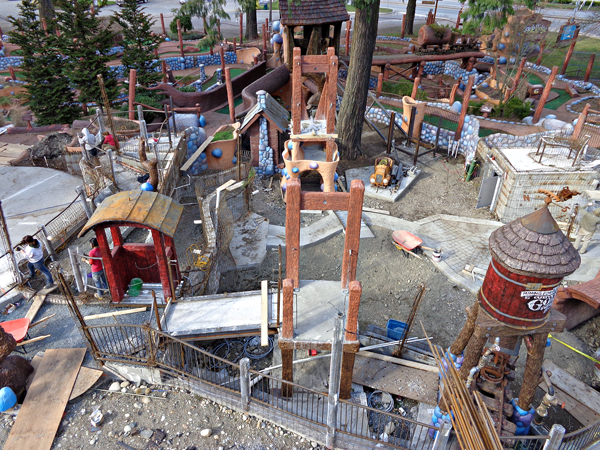 The entrance to the park is past the red operator's booth up the ramp turn left and then over a swinging bridge (not yet installed). At the middle support for the bridge the kids can go straight ahead over another narrow swinging bridge to the tree fort or turn left again and go over a third swinging bridge to the walkway that winds down a switchback path into the park. The gold panning flume will be just below the first bridge running down from the water tower. Swinging to the right I snapped another picture. The crawl through log is near the bottom with the 120 lineal feet of caves under the wde walkway on the right. The shallow walking pool is behind the water tower with the waterfall mountain just behind that. A short tunnel goes under that mountain to the lookout over the pool. The barrel bridge will span the bigger pool. Behind that is the younger kids activity center. All the pieces for that area are prefabricated and ready for delivery soon. 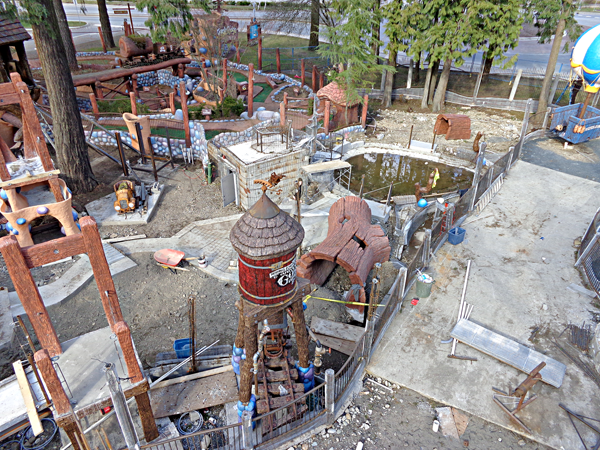 Next week we will finish the welding in the Wilderness Adventure area. 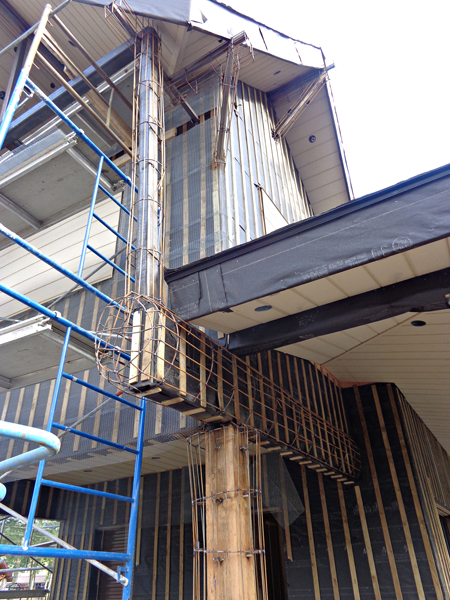 The crew will follow with all of the lath and then we will start in on the fiberglass reinforced concrete. The weather will be warm enough right about the same time.